The First United Methodist Church of Mansfield, Pennsylvania and the First United Methodist Church of Ogden, Utah, have joined together in a Methodist Bicentennial project. In researching information for the Mansfield Church and the 1984 Bicentennial of the Methodist Church in America, Mr. Chester Bailey began gathering information about a former pastor, H. S. Parkhurst. Reverend Parkhurst was pastor of the Mansfield, Pennsylvania Methodist church during 1873 – 1874. He lived in the parsonage at the corner of Elmira and North Academy Streets. Rev. Henry S. Parkhurst became the Pacific Colony representative and made a trip to the west coast area in Oregon in 1875. He returned to Mansfield and gathered a group together and they left from Corning, New York by train on Monday, October 25, 1875. A circular letter No. 2 stated the whole expense of the railroad; steam boat, hotel fare and incidental expenses to Hood River, Oregon, would be about $100.00 for adult and $50.00 for children between five and twelve years of age. Each whole ticket was entitled to 100 pounds of baggage and half ticket to 50 pounds. Rev. Parkhurst the leader of the colony, became sick at Ogden, Utah, with an attack of Typhoid fever and died. He was buried in the Mormon cemetery on November 13, 1875. The first Methodist minister ever buried there. An Oregon paper stated that: "The Oregon Colony from the Atlantic States arrived in Oregon on the steamer Ajax, November 11, 1875. The colony consisted of 97 persons. Most of the members of the Colony came from the Keystone State, but some from New York and Wisconsin. After a safe trip from the west they proceeded up the Columbia River to Hood River, where they will become permanent settlers." Reverend H. S. Parkhurst, wife and children. Mr. Allen, wife and child. Mr. Miles D. Potter, wife and children, Ida, William and Happy. Mr. Lyman Smith, wife and children, Eleanor, William J. and Dorrence. Mr. James W. Wallace, wife and children, Lettie, Albert and Charles. Mr. Alfred Ingalls, wife and children, James, Gertrude and Maggie. Mr. Ira Wright and wife. Mr. Nickolas Bills and children. Naomi Wilcox, niece of H. S. Parkhurst. Arthur Parkhurst, nephew of H. S. Parkhurst. The complete records compiled by Rev. Parkhurst were taken with the colony to Oregon. Recently the Oregon Historical Society has made a study of the Hood River Pacific Colony. Local contacts have been made with the decendents of the Ingalls and Phelps families. It is believed that Mrs. Parkhurst moved onto Seattle, Washington, since a letter appeared in the local Advertiser paper in 1877. She was involved in the Temperence Movement through the Seattle Methodist Church, Sunday School. Ira Wright and wife returned to Mansfield. Parents of Mable Wright [who ran the Wright Shop in Mansfield for many years]. The Ogden, Utah, First Methodist Church became involved when asked by Mr. Bailey if someone there could locate the grave site. If it was marked the Mansfield Church would like to place a plaque on the stone. Miss Zelda Evans, membership secretary responded that considerable interest was expressed by their church. They have been very cooperative. They found the area of the cemetery where Rev. Parkhurst was buried, November 13, 1875, and indicated the grave was not marked. In further research there, it was learned that the Reverend Mr. Marshall Howlson, who was pastor at the First Methodist at that time probably had the service for Rev. 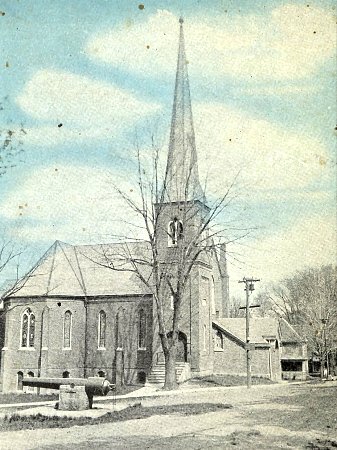 Parkhurst, as it was the only Methodist Church in that area in 1875. The Ogden, Utah church offered to make a spot available in their building for a plaque in memory of Rev. Parkhurst. Ceremonies were held in the Mansfield Church and a plaque was sent to the Ogden church thus completing a Bicentennial project that reaches a distance of several hundred miles… The Ogden Church held a ceremony and placed flowers on the grave. This colony, which left Elmira for their new home in the Far West, the latter part of October, attracted a great deal of attention, and information of it has been looked for with much interest. Yesterday Mr. P.A. LaFrance of this city received a letter from his son Shearman J. LaFrance, who went out with the colony. It is the first word that has been heard from them since they left. It is written on the 16th of November from Hood River, Oregon, and they had not yet heard of the misfortune they had met with in the death of their leader, Rev. H.S. Parkhurst, whom they were obliged to leave at Ogden. The letter, from which we are permitted to make extracts, gives a lively account of the journey. After leaving Omaha, the party were “full blooded emigrants.” At Sidney, Nebraska, they saw the cheerful spectacle of a man hanging to a telegraph pole. They were told that he had shot a young man and “that was the way they did things out West.” At Wadsworth, Colorado, they stopped to bury a child of one of the colonists, that had died with lung fever. Here they met a Mr. Charles Norton, who formerly lived in Elmira and who is now a resident there. The stay of the party in San Francisco was brief, as they arrived there at one o’clock Saturday morning and left there at ten the same day, taking the boat for Portland. Most of them suffered dreadfully with sea-sickness. “ You may talk about learning to smoke or chew tobacco,” says the letter, “that is nowhere. Of all the ailments that a person ever had, sea-sickness ‘lays over the deck.’ I did not have it very bad, but a little goes a great way. I can say this much for that ocean, that if ever I come home, it will be some other way than by the Pacific.” Mr. & Mrs. Charles C. Hall, recently of this city, were passengers on the boat with the colonists, and a Judge Sawyer of the United States Circuit Court, of San Francisco, who used to teach school down the river from here, and remembered with pleasure some of his scholars, whom he named. On Sunday, the colonists had services on the boat, conducted by a Rev. Mr. Knowles of Chicago, young LaFrance himself having charge of the singing. On Wednesday afternoon, they arrived at their destination. Considerable home-sickness prevails, and the party was not located at the date of the letter as the surveyor, Mr. Smith, had not yet come. The writer gives, what might almost be called extravagant pictures of the country and climate. He had eaten a strawberry, picked the day before the arrival of the colonists. It was the second growth and was as large as a horse chestnut. Everything else was in that proportion. Everything seemed to promise favorably for the future of the colony. --- Elmira Advertiser. A recent letter from President Watson gives a few items that may be of interest to those contemplating going Hood Riverward. He says that the land in Hood River valley is comparatively level, and that there are 10,000 acres yet unoccupied. It has fruit advantages over any and all other localities north of California. The climate is remarkably salubrious. During a residence there of five years with a wife and five children, he has not paid a cent for doctor bills, neither has any of his family been sick three days at any one time. They have a first-clad resident physician, but he has not been called upon to see the sick half-a-dozen times in said five years, except as an accoucher. Hood River valley is the only reliable peach location north of California, and soft shell almonds can be successfully grown there. A man can cultivate twenty acres and make more money [without capital also] than he can by growing grain exclusively on 160 acres. This valley is first cast of the Cascade range of mountains, and is surrounded by high mountains, on the south, west and north, which are covered with timber [the first timber for near 200 miles from the east], with an empire of rolling hills, capable of being cultivated, a large portion of them covered with the best grasses known for grazing purposes. Its altitude is about 300 feet above the sea level, occupying that peculiar latitude so favorable to the growth of fruit. The maximum temperature of last winter, one day and night, was four degrees below zero. Peach trees seventeen years old have only missed bearing once. The malicious rumor that the late Rev. Mr. Parkhurst received a large sum of money for locating the colony at Hood River, is emphatically denied by Mr. Watson, who says that Mr. P. never received a farthing. He closes by predicting a bright future for Hood River Valley. Dear Sentinel: The object of this letter is to make a plain statement of unvarnished facts, relative to the present condition, and future prospects of the Hood River or “Pacific Colony,” which left Northern Pa. for Oregon under the guidance of H.S. Parkhurst, on the 25th day of October, 1875. Several articles pertaining to their whereabouts, and doings, have already been published. One of them, published at Dalles, under date of November 22nd, 1875, and copied by the Mansfield Advertiser, Jan. 12th, 1876, I shall have occasion to notice, as there may be some impressions gathered therefrom by the good friends east, prejudicial to the genuine facts in the matter. H.S. Parkhurst and family, Mansfield, Pa., died on the journey. * C.W. Phelps and family, Mansfield, Pa., now at Hood River. * A.L. Rumsey and wife, Mansfield, Pa., at Hood River. Mrs. S.C. Gardener and family, Mansfield, Pa., now at Portland. Mrs. A.B. Mott and family, Mansfield, Pa., now at Salem. N. Bill and family, Arnot, Pa., left the valley. Robert Dunsmore, Arnot, Pa., left the valley. James Dunsmore, Arnot, Pa., left for Pa.
John Fleming, Arnot, Pa., now at Hood River. * Ira Wright and wife, Canton, Pa., at Hood River. * M.B. Potter and family, Canton, Pa., at Hood River. H.R. Wilcox and sister, Canton, Pa., at Hood River. P.H. Harding and Son, Canton, Pa., at Hood River. * John Tyler and family, Covington, Pa., at Hood River. Lyman Robbins, Covington, Pa., left the valley. * Alfred Ingalls and family, Arnot, Pa., now at Hood River. J.W. Wallace and family, Arnot, Pa., now at Hood River. C.E. Forsyth, Farmington, Pa., in W. Territory. H.W. Rogers, Mecklenburg, Pa, now in W. Territory. C.J. McKenzie and family, Philadelphia, Pa., now at Hood River. Nathan Church, Morris Run, Pa., now at Salem. Edgar Burr, Allegany, Pa., now at V. City, Nevada. M.B. Hotchkiss, Blossburg, Pa., now at Portland. * Lyman Smith and family, Chemung, NY, now at Hood River. A.W. Parkhurst, LeRoy, Pa., now at Hood River. John Hamilton, Corning, NY, left for home. *W.S. Allen and family, Illinois, now at Hood River. Francis Warren and family, Sullivan Co., Pa., now at Salem. S.J. LaFrance, Elmira, NY, now at Hood River. By the list above you will notice eight names, marked with a star, indicating such as have located claims in this valley. The remainder of those here, seven in number are unsettled and undecided whether to stay here or not. All the balance are scattered and left here, not expecting to return. Two or three have gone back to Pa., one to NY, Burr, Robbins, Hamilton, Fleming and Tyler, have sold their certificates, they all together held 7, the lowest was sold for the modest sum of $12, and the highest for $20. There are a few more that could be purchased below first cost to my knowledge. The letter to which I before alluded as copied in the Advertiser, states that with “two or three exceptions, the colonists are delighted with the country,” “busily employed,” purchasing homes, etc. The facts are that the delighted one, and those “busily employed,” are the exceptions; many of the number who are here now, have been staying in idle suspense, simply to “see the thing through” as each had his twenty-five dollars invested. “The school of the high order” to the interests of which large donations of land have been given, is a matter far in the future. At this time, the school here will not average six pupils. That “700 lb. steer” no doubt astonished our two butchers by his specific gravity. I know he must have been a heavy fellow, by the prices we were charged for the beef. One of our men paid 4 cents per lb. for an ordinary piece of his neck, when the market value of the hind quarter was not more than 5 cents. One clause in the letter seems to me rather ambiguous. “On the payment of twenty-five dollars, and other appendages being considered favorably, secures the title to a town lot.” Now we paid $25 last fall but exactly what is meant by “other appendages” I do not pretend to know; one thing I do know, that not a man has yet got his title to a town lot, nor, is it known by the wisest member even, where or when the said town will be located; urgent inquiries have been made of the donors, about the same, and though we are told it is “all right,” nothing has been done. Could the thing have been arranged when we first came here, as it should have been, men who have been here three months in suspense, doing nothing, could have improved their lots, and if they wished, built upon them. I can’t see that it looks much like business. Now much of this perplexity and annoyance can doubtless be justly attributed to the death of Mr. P., for from the time he was taken sick, we have been without a competent leader, especially, to direct out finances. I must say here, that I do not wish to reflect in the least upon the ability of our friend Allen, for we will agree to the fact that he was seldom if ever known to take exception to any proposition presented, and seemed ever ready to sanction anything and everything to please us all. It was rather unfortunate for us however, that in their previous journey here, as a locating committee, for whose expenses this colony had to pay, that this gentleman had not been a little more observing and attentive to the interests of the colony. Had he done so, it would evidently have relieved our worthy brother Mr. P., and made the final settlement between the locating company and the colony much more satisfactory. Mr. Watson, the writer of the article referred to, and copied from the Dallas paper, is a gentleman of ability, president of the Pacific or Hood River Colony, and in my opinion in every way competent to set forth to the public a fair and just statement of the condition of things here, and the reason why he has not done so must evidently be attributed to one of two reasons, either he had not given the matter sufficient attention to learn the situation, else the facts were likely to collide with his individual interests, which it will be remembered are extensive in this valley. The latter is certainly a very ungenerous conclusion and we should all as gentlemen, be slow to expect it of him. Nevertheless I one knew a lonely proverb, that “facts are stubborn things,” and as I have ever believed the same to be true, I shall not attempt in this article to get around them. I think enough of this letter has already been devoted to the condition of the members here whereby a tolerably correct idea can be formed by those interested in their welfare east, and fearing I may exhaust your patience will devote the remainder to a somewhat detailed account of the country of Hood River. Every member of our party as far as known left their friends in the east, to settle in the far west, with the best of intentions, to secure and make comfortable a home where the climate and soil was more congenial to health, and prosperity to the man with small means, for very few of the colonists has very much money. A few had nothing scarcely upon their arrival here. Was given in a former letter, as nearly as may be perhaps; certain it is that no such territory as that named in the circular, can be had here, without lapping largely on the mountain sides. On this [west side] of Hood River [the most desirable upon which to settle] we found vacant but one whole section of the government land, and that was so stony, most of it, that it was not at all desirable. Besides it was nearly destitute of water. A very few detached forties of similar quality was here and there to be found, which made up the “sum total” of the vacant government land on this side of the valley. In order to get to the lands on the other side of the River, a roundabout way of three or four miles must be taken. A mountain fully equal in extent and grade to that on the road to Fall Brook from Canton, to climb, and you reach a point on the opposite side of the river. The amount of government land on that side is a little more, but all that is desirable is claimed by somebody. The best of the land of whatever kind, is held as somebody’s claim. Railroad, School, and State land can be has in different places, it one want to buy, but the chances to homestead are inferior. Almost every place where a good spring or stream of living water is found, except on very rough land, you will find claimed. Most of the holders of claims will sell if they can get stamps enough for them. I have heard of one or two however, that were not for sale, and there may be more. The general impression obtained by all of us from the circular was, that the land in this valley did not need to be irrigated, but the evidence here lead to the conclusion that not6hing but a fall crop will do well without it, and we are told, that to start fruit in most places, successfully, you must irrigate. To bring out Hood River so as to irrigate the valley generally would incur more expense than its present population can afford; they are for the most part poor, and will do well if they can make a living of it, many of them, without heavy taxation. All do not tell the same story about irrigation, but it’s safe to conclude that some things must have water in order to mature. Is decidedly sandy, and in many places it is little else but san. A kind of vegetable loam is mixed with it in some parts of the valley, giving it a darker color and the appearance of fertility. There is no clayey substance of any account. As no sod can be raised of timothy or clover without irrigation [probably] the cultivated field must have a periodical rest, in order to insure a crop. Most of the soil seems to be of a nature to absorb moisture rapidly, as little or no water stands on the surface, even when the snow is melting, or after a heavy rainfall. There can be little doubt that this valley is well adapted to fruit, as fine specimens of different varieties we have seen. Just a few words in reference to the present and future prospects of the settler here will bring to a close this protracted sheet. The only outlet to any place from Hood River at present, is the Columbia. This valley is about midway between two Cascades, each about twenty miles distant. A rich company entir5ely control the navigation between the same, and own the right of way around them, so that the charges on freight are enormous, and, until the government steps in with an appropriation, sufficient to make locks through those obstructions, the producer has a poor show to a market. At present, large tracts of land nearest the Columbia River are owned in one body, so that settlers must necessarily be remote from each other in such places. The great Hood River ditch is not made, nor will it be soon, unless by capital that is not here now. In order to exist here for a time, the man with his family must either use the means on hand, or work in some place distant, leaving his family in the meantime, unless men come in here from other places with money to build the town, or start some enterprise to furnish employment. I for one expect to stay in this section awhile yet, but I must see a better prospect ahead before advising a friend to come here to settle, neither do I say don’t come, but feel a consciousness of doing my duty in the matter, by writing these facts. Everything relating to the colony are facts. My opinion as to the country is of course immature. As it will be some time before we can give you the circular letter, and I have a little spare time. I will try to improve it by writing a few lines concerning Hood River. The weather here is at present somewhat unsettled, but it is very nice for the month of March. The coldest weather we have had this winter in one degree below zero, but lasted only a short time. We have no sudden changes which you so often experience in the east, therefore it is considered to be one of the most healthy places on record, and I think it must be so for when I left home my average weight was 150 lbs., and now I weigh 169 pounds, a gain of nineteen pounds in eight months; but two weeks of that time was emigrating [so I don’t understand]. The winter has been short and very co9ld and not much snow. Mr. Lyman Smith who came from Chemung, NY, and with whom I am now living, ------------ only one month, and his horses and cattle are looking as well if not better than stock in the east at this time of the year. This is no exception for it is the same throughout the valley. We have some rain but not one-tenth part of what they have in the Willamette Valley. The summer climate I cannot say much about but from present appearances it must be a delightful place, for the prairie, even early as it is, is completely strewn with wild flowers. Now you must not think you can have all these nice things without some poor one with them. To engage in general farming irrigation will be found necessary, which can be done at some expense. I am not prepared to say how much, but without irrigation you can raise winter crops, such as winter wheat and rye, as well here as anywhere. Mr. Lyman Smith broke up new ground last fall and put in rye, and this spring it is looking good. The land throughout the valley is good as near as I can find out from good judges, not being a competent judge myself. But remember it is a new country and a very good amount of timber on it, which until we build will be more or less in the way. The circular letter stated that there would be enough to use in building houses, barns, fences, etc., but I think a man would have some to sell. The timber is principally pine and will make good lumber, if there can be a way provided to manufacture it. There is a mill here, but they talk of taking it to the Centennial. There is some oak timber, but it is good for nothing but wood. There are some stone, but I know of nothing they can be used for on account of their queer shape, and a great many of them are very large. However, there are not enough of them to interfere with good farming lands. The road from the Dalles, a town 23 miles east of this valley, will probably be completed this summer, and then we can get out cheaper with horses than we can by water. And undoubtedly this will be a fine thing for the valley, as they expect to go through to Portland when the road is finished. The Northern Pacific Railroad has an extension of eight years, therefore it will be some time before we can have a railroad. We had a school this winter, but the attendance was very small, the most of the children being too small to walk any distance. We have had Sunday school every Sunday, and preaching once in four weeks, and the house is generally well-filled. We expect to build a new school house this summer. Now I will tell you something about the fruit that grows in this country. I have seen peaches that six of them would fill a two quart can. And I have seem stems of grapes that would weigh from three to five pounds each, and I find that all fruit raised here is in proportion to the above named. But you must remember that is takes time and labor to accomplish these things. You can grow fruit without water as well if not better than you can with it, for fruit in this country is often spoiled by giving it too much water. Mr. E.L. Smith a resident of this valley and a gentleman of high culture says he can raise on a half an acre of ground $500.00 worth of peaches in one year. Now this is no more than anyone can do if they have the land. I will tell you a little about the land. The government land that is worth anything is all taken. But there is school land and State land that can be had for $1.25 and $2.99 per acre. This land is very good, being a clay subsoil; consequently it does not dry out as quick as some land in the valley. I am not prepared to say how much of this land is vacant, but there are a great many acres. New settlers are coming in constantly and if you want any of this land, you must come and get it before it is gone, but if you do come you must make up your mind you are coming to a new country and you will have to put up with a great many difficulties at first and no -------- will wish yourself back a great many times. I want you all to get the right idea of this thing and then do as you think best about coming. I would advise no one to start with less than a thousand dollars, for I know those here that if they had money to go on with they would like the country a great deal better. Women and girls who will work out can get from fifteen to twenty dollars a month in private families. The seminary that was to be built is not commenced and it will be sometime in the future before we can have a school of that kind. Now we want men to come in and put up a saw mill and a sash and blind factory. You can get any amount of power in Hood River. Anything of this kind will pay very well. A gentleman by the name of Mr. Frank has started a harness shop, and I think he will do well. He is a gentleman in every respect and takes things just as anyone should in a new country. No doubt you have seen a letter or letters written by P.H. Harding, a gentleman who came from Canton, PA. Now I do not wish to say anything against Mr. Harding, but I will say that he has placed the shabby side out on everything. When Mr. Harding first came to this valley he was dissatisfied and he has been so ever since and as near as I can find out he is dissatisfied anywhere. I think he has tried his best to make it unpleasant for himself and all those around him. Now I do not wish to be understood that Mr. Harding writes that which is not so, for there are a great many facts in his writings. But he has put them in such a shape as to give people to understand that we all coincide with him. Now that is not so, for I think that the colony would be well pleased if they were in their new houses, which they expect to be before long. As it is not they are living in what is called a barracks. It is divided in five different rooms, with a chamber over each, and of course it is different from the way they have been in the habit of living. Now I have tried to write nothing but facts in the above letter, and it is left for you to decide whether you like this country or not. But I will say if you are well situated where you are, stay there, for when you’ve got a good thing keep it. The Hood River colonists have presented Mrs. H.S. Parkhurst with lumber enough from the barracks for a house. “I like this country much better than old Tioga County. I know you must have a good time arguing about Hood River, for you have so many conflicting reports. I will say right here that those who report this country to be so bad, do not know any more about it than you. When this colony arrived at Hood River they were a comical sight to behold – the most tired, dirty and homely lot of men, women and children that I ever saw. The men and boys took their lunch baskets in one hand and a hunk of bread in the other and started on foot for some place of entertainment. After about a half hour’s walk we arrived at the place that we had come 5,000 miles to see – Hood River. As it was about dark I did not take much notice of the surrounding country that night, for I had all I could attend to, to get a comfortable place for my little brood, which I found. The most of the men had to sleep in barns, but the women had good beds. I got up in the morning early to look at my new home. About the first thing I saw was some of the colony lo9oking at and cursing the country. I thought I would wait a little before I expressed my opinion. After taking in some Hood River hash, I started up a little hill which I made in a few minutes, and after strolling a short time I began to get more reconciled to my new home. I could stand on level prairie that extended for miles and see the bold and gigantic Mount Hood on the south, which is 13,000 feet high, and Mount Adams on the north, which is 11,000 feet high, both covered with snow the year round. I could look down into the valley and see the steamer Daisy Ainsworth plodding her way up the mighty Columbia. I spent the afternoon in looking through the fruit orchard, and found the largest specimens of fruit that I ever saw, and was not backward in testing their quality. This was my first day in Hood River. “Now I have been here almost a year and think I understand this locality as well as those that only staid here a short time in the winter season. In my opinion, so where else in the United States can so many good things be found in their perfection as in Oregon. “Our colony is a failure. Through the misfortune of losing our leader, Mr. Parkhurst, it became demoralized. They were like a flock of wild geese without a leader, and parties here at Hood River took advantage of our misfortune. The colony was in possession of $558., which they were soon relieved of. W.P., Watson, Pooler and others got a good share of it for work and supplies, and the balance the treasurer holds and refuses to pay back. Mr. Editor: Permit me through your column to thank Mr. Seth Whittaker for sending me the Mansfield Advertiser. Though far away from the footprints of my more youthful days, and at present identified with the interests of another State, I cannot afford to be without your valuable and ably conducted paper – its columns are so replete with spicy notes and local intelligence of persons and things once familiar to me, and still dear to my memory. But as the throbbing and busy world moves on, men are scattered broadcast searching for the good of their destiny. This order of things finds me separated from the home of my childhood and settles in business at Hood River, Oregon. This place is located on the Columbia River, twenty-five miles from Dalles City, and seventy-five miles from Portland. It is well adapted to agriculture and stock raising, and especially noted for fruit. The climate here is usually mild with scarcely any snow, but this winter is an exception. We have has a very severe snow storm, which has caused a great loss of property and lives. A young man by the name of George Pratt, while at work at a saw-mill about ten miles below here, was buried alive by a snow slide. The particulars are as follows: On the morning of the 11th, on going to work it was found that there was no water in the flume. The foreman asked Mr. Pratt to go up the canyon and turn the water in. Accordingly he started, taking with him an ax and hatchet. As it frequently took some time to turn the water, nothing was thought of his prolonged absence till night, and as he did not then return, the men, becoming uneasy, started in search of him. On nearing the canyon it was found that there had been an immense snow slide of some twenty feet in depth, just at the flume. Fearing that the poor man was buried alive, all hands commenced to dig in search of him. They continued to dig for two days, at the end of which time they reached the flume and found the hatchet he had taken with him, assuring them almost positively that their fears were well founded. On returning the third day they found that another avalanche had come down from the opposite side, filling in the snow they had displaced, and making a depth of nearly thirty feet. Seeing the imminent danger of working there, and knowing the man was dead, it was thought best to do nothing further. At last accounts the body was still under the snow.